Tteok has a reputation of being traditional food that often appears outdated with the same old taste. 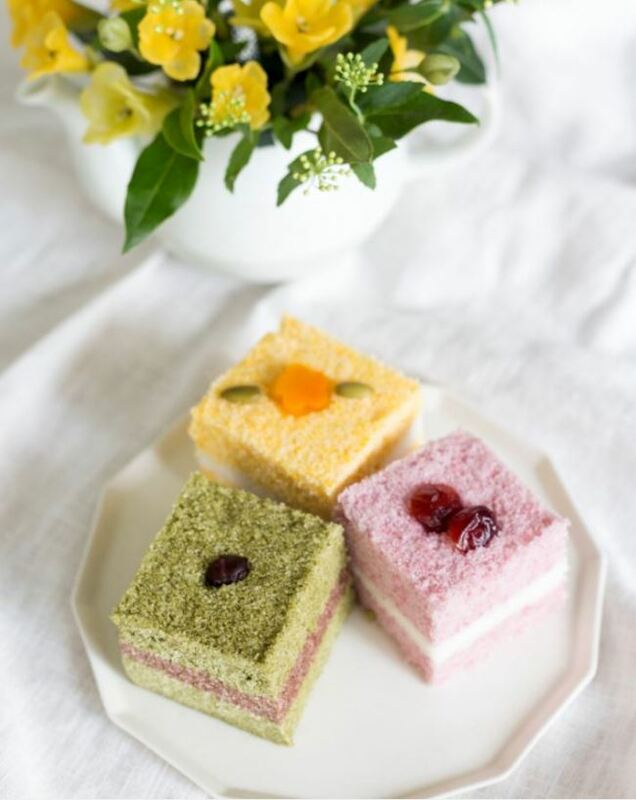 But Korean rice cakes can be transformed into delicate desserts that are pleasing to the eye if they are handled in a different way. Jang Yeo-jin is one such person offering a fresh take. The owner and instructor of Morak Morak Table, a tteok cooking studio in eastern Seoul, has come up with new versions of Korean rice cakes. At first glance, Jang’s works might not look like tteok. She uses various baking tools, techniques and ingredients to reinterpret rice cakes with a new insight. 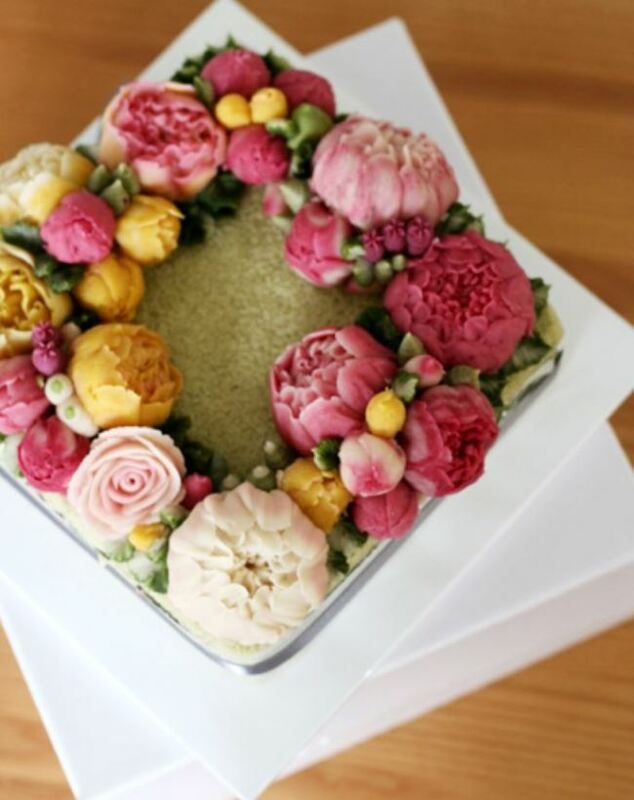 In the realm of fusion tteok, flower-decorated rice cakes are the most widely known. 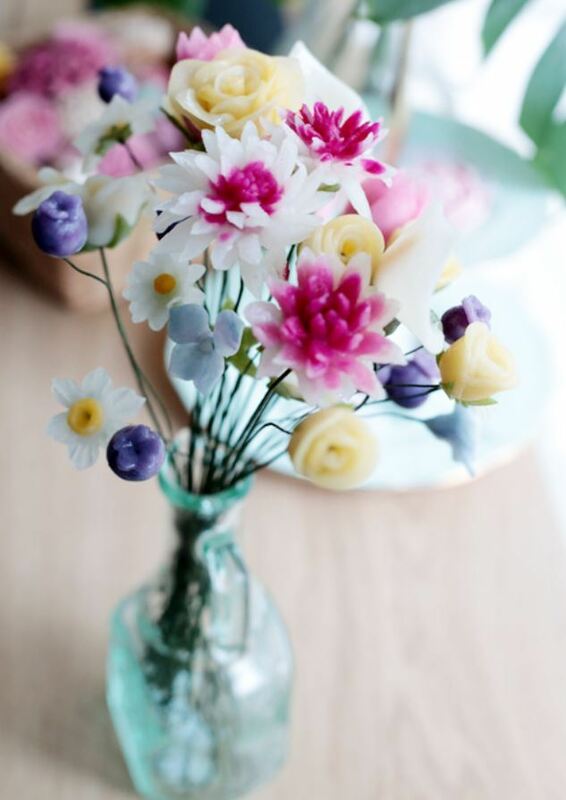 A sheet of tteok is adorned with sweetened bean paste flowers on top, similar to buttercream decorations. There is also a reinterpretation of the ordinary songpyeon, half-moon rice cakes traditionally eaten during the Chuseok holiday. 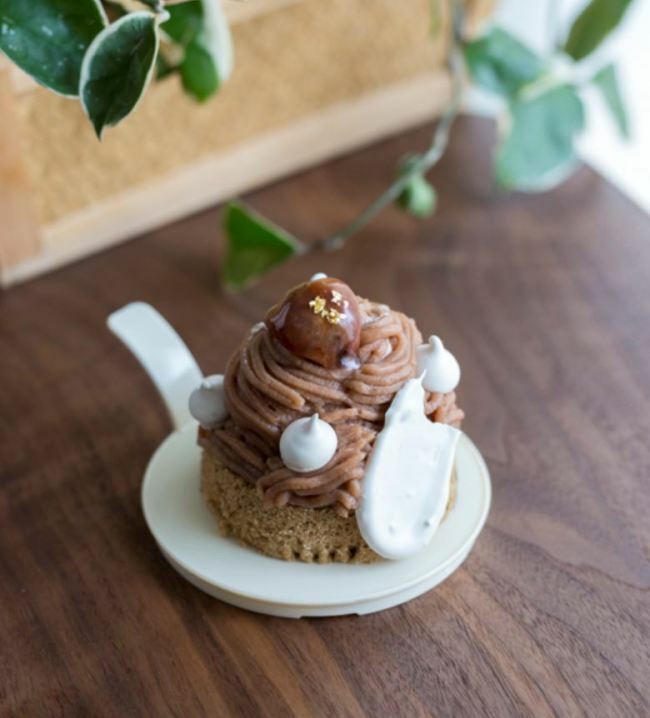 Putting a different spin on the traditional food are new-fangled flavors and tteok decorations that are more detailed and delicate than one can imagine. For example, the strawberry Mont Blanc tteok cake features strawberry cream added to the top of a strawberry-flavored sheet of tteok. Simper versions are possible as well. Jeolpyeon, patterned rice cake, goes beyond its usual taste with matcha and chocolate fillings. Jang sometimes goes over the top, exercising her creative flair. She once made an edible ornament of flower-shaped tteok using small pieces of jeolpyeon. “I actually didn’t start with the purpose of making pretty tteok, but somehow my tteok became prettier and prettier. It’s just about how you place and use a certain ingredient,” she said. 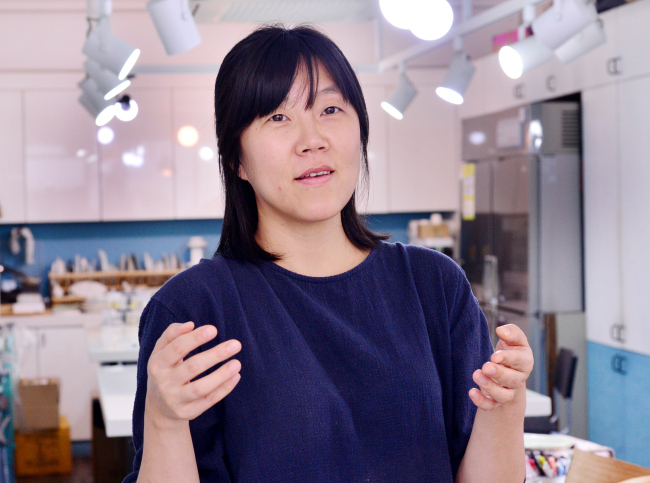 Jang attends one-day baking classes, to infuse new ideas into the making of tteok. 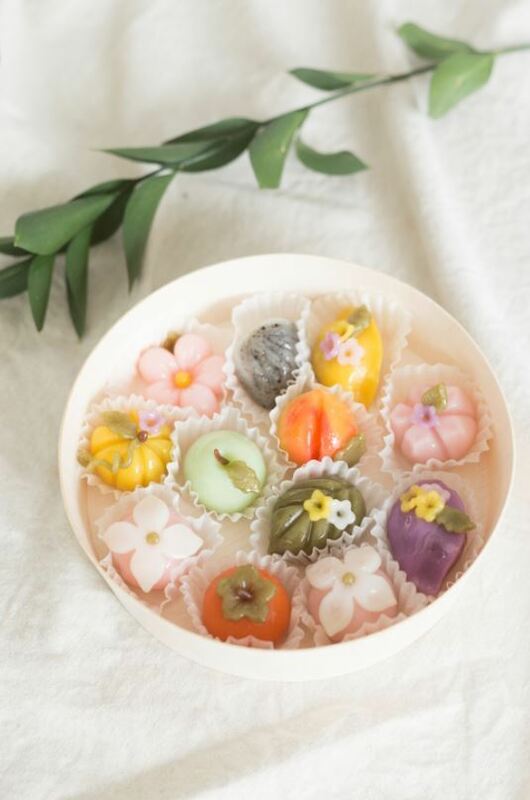 She is also learning more about traditional Korean desserts and Japanese traditional sweets, such as wagashi. In addition, she instructs tteok cooking classes at her studio daily. Her students -- usually women, though there are some men -- are a mix of people who want to learn how to make tteok as a hobby or for professional reasons. “There are people who come a long way for the classes. I always think I should reduce the frequency of my classes in order to make time for writing books, but when people desperately ask me with passion, it’s hard to refuse,” she said. Despite her passion for tteok, Jang doesn’t sell any at Morak Morak Table. “Running a tteok store is very difficult. As tteok has a short expiration date, it is hard to handle. Also, when mass producing, it can be hard to make pretty tteok. I’d rather teach others that it isn’t hard to make tteok and that we can all make it at home,” she said.